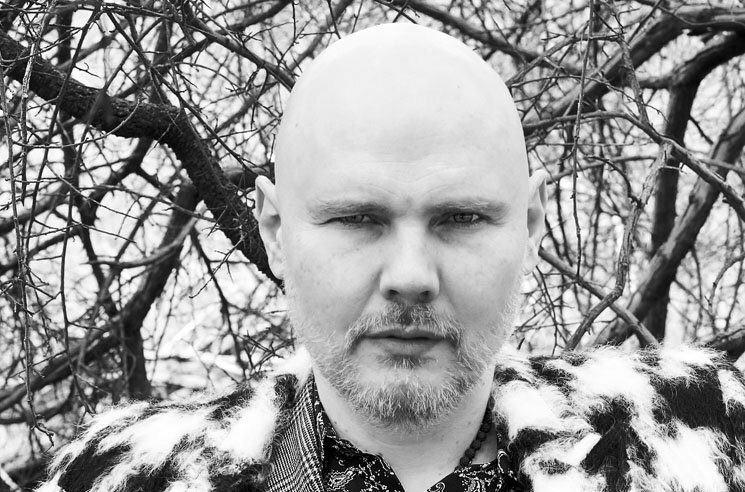 Having mapped out the immediate future for the Smashing Pumpkins, Billy Corgan is now visiting the past by piecing together the Machina box set reissue he alluded to last month. Two days into the process of piecing the set together, Corgan has shared some thoughts and reflections on the album sessions, as well as his current trip through the archives, via his Instagram. The first Insta post from Corgan shows a studio log from 1999, displaying the band's recording process for Machina/The Machines of God track "Raindrops + Sunshowers." Notes in the margins indicate takes involving different bass parts, instruments played through different gear, overdubs and new arrangements. In listening back to the DATs (Digitial Audio Tapes, our preferred all purpose way of documenting (cheaply) any manner of things during sessions) I noticed a clear breach; music made before the 1999's Arising Tour, and after. The songs, and recordings, before, more conventional and linear; those made after disassembling into a more unfamiliar music that is in search of not so much a core sound as an aural disintegration. Now, I admit i was the main driver in this exercise, but listening to the song's earliest incarnations, the contrast in approach becomes stark post-tour, as do the songs written thereafter. MACHINA itself not really being born until we'd toured, fallen apart in excess, and regrouped around the search for a proper funeral that never really came. Here's a few curiosities I found traipsing, in no particular order. Recordings of James and I preparing for our Bridge School show at the end of '99, with songs like Tom Waits''Ol 55' and @u2's 'Stay' charmingly documented. Also, Machina tour rehearsals I guess recorded in-studio, with a blistering and fresh version of 'Everlasting Gaze'. Lots and lots of work product, where a hearty soul could literally listen to the evolution of a given song from the band learning the song to later, hearing us rip it apart at the seams and the silly dialogue in-between. The slow devolution of the sessions from, as stated before, conventional music and approach to a near-abandonment of propriety and everything from then on slung at electronic walls and beats in the hopes to find something new. Songs like 'Heavy Metal Machine' and 'This Time' being given scant oxygen to mature, whilst other less worthy were given ample hours to flower. As Alternative Nation points out, Corgan has also been continuously fielding questions from viewers of his Instagram story. When asked if a third Machina album would be recorded with the band's current lineup, Corgan wrote that he had "found 4 songs that were never finished that I think it would be cool to record new versions with James and Jimmy." When later queried on if the plan to release both Machina albums "as originally conceived" would result in any tracklist changes, Corgan responded that the "plan is to 'finish' the album as a conceptual work and properly sequence." While reissues of both Machina/The Machines of God and Machina II/The Friends & Enemies of Modern Music have yet to receive a concrete release date, the Smashing Pumpkins will deliver a new album next month. See some of Corgan's posts below. #MACHINA: In searching through the never-ending archives yesterday (I'm two 8-hour days in and haven't come close to the bottom of the barrel), I found myself ruminating on a particular song. And said as much to my engineer Nikola. 'It's taken me thirty years to realize that I write songs for movies that may never get made. I create a unique world in my mind, and these efforts are my response to that world.' And what's so beautiful now with the technologies available to the touring musician is that, as seen with the Shiny and Oh So Bright staging, I was able to bring some of that particular movie to you live. Which of course sets up the next logical question: What's the next movie SP will play to? Answer: you'll see soon enough.... But back to Machina. Here's a few curiosities I found traipsing, in no particular order. Recordings of James and I preparing for our Bridge School show at the end of '99, with songs like Tom Waits''Ol 55' and @u2's 'Stay' charmingly documented. Also, Machina tour rehearsals I guess recorded in-studio, with a blistering and fresh version of 'Everlasting Gaze'. Lots and lots of work product, where a hearty soul could literally listen to the evolution of a given song from the band learning the song to later, hearing us rip it apart at the seams and the silly dialogue in-between. The slow devolution of the sessions from, as stated before, conventional music and approach to a near-abandonment of propriety and everything from then on slung at electronic walls and beats in the hopes to find something new. Songs like 'Heavy Metal Machine' and 'This Time' being given scant oxygen to mature, whilst other less worthy were given ample hours to flower. We resume work Friday.